As part of my 2 week test of crock pot recipe’s, this came out as one of our favorites. To read the reviews from my family read my blog post Crock Pot Revolution – Slow Cooked Meals on Trial – Part 1. I’m including this recipe for those of you who would like to try it. This recipe had A LOT of flavor. It was fabulously delicious. I normally don’t like mushrooms but my husband loves them. I have to admit I loved them in this dish. Very good!! This recipe is an effortless way to have a traditional meal ready. Leftovers make juicy steak sandwiches. In a large bowl, stir together all ingredients, except steak. Place steak in a 5-quart slow cooker and pour garlic mixture over top; stir briefly so steak pieces aren’t pressed firmly together. Cover slow cooker and cook on HIGH heat for 4 hours. Remove steak from slow cooker and let sit for 2 minutes; slice steak on the diagonal against the grain. Arrange steak on a platter and spoon vegetables and gravy on top. 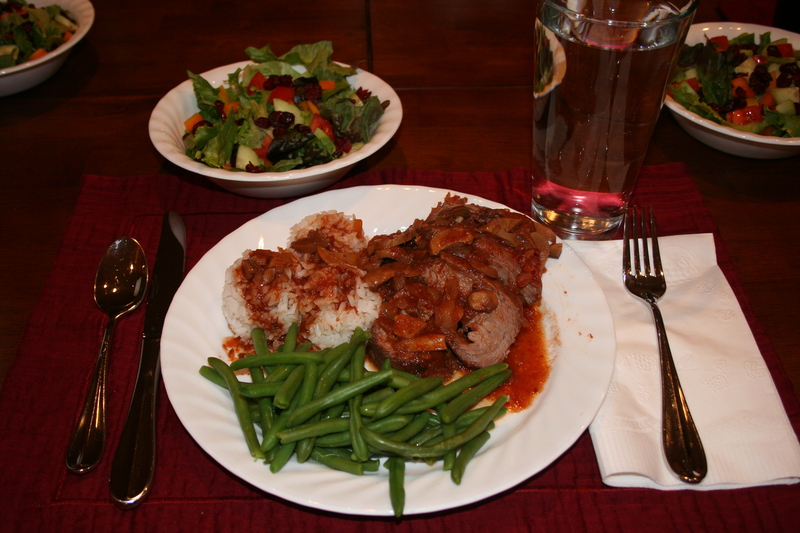 Yields about 1 ½ cups of meat, vegetables and gravy per serving. This recipe is excellent served with roasted fingerling potatoes. Precook them and then just reheat before serving.